Am I the only one who often feels more panicked than relieved when the week is half over? The days are getting shorter, both figuratively, and literally, and more than ever I feel like I can never make enough time to check everything off my to-do list. I do use the word 'make' intentionally. It's a bit of a peeve of mine when someone tells me that they do not have time. Everyone has the same amount of time, but you make time for the things you want/are obligated to do. It particularly infuriates me when I hear someone use the phrase "If I had that kind of time." Because that person is essentially saying "I think what you love is stupid." For the last five years I have always made time for the blog, and I have every intention of continuing to do so, but lately there have been so many other things I want to make time for as well, and as a result, less time gets spent on the blog. I feel guilty about this, but I also need to remind myself that for the last four years I have posted five days a week, and not once have I taken a vacation. I think I am long over due. I no longer make lists, it upsets me to see I have so much pending to do. If I told you… I've had a house in blueprint for over 5 years and just last night I was going over it again and that is just ONE thing. Meant to say think, not thinkS. You look just fabulous tho--love the bold color on you!! 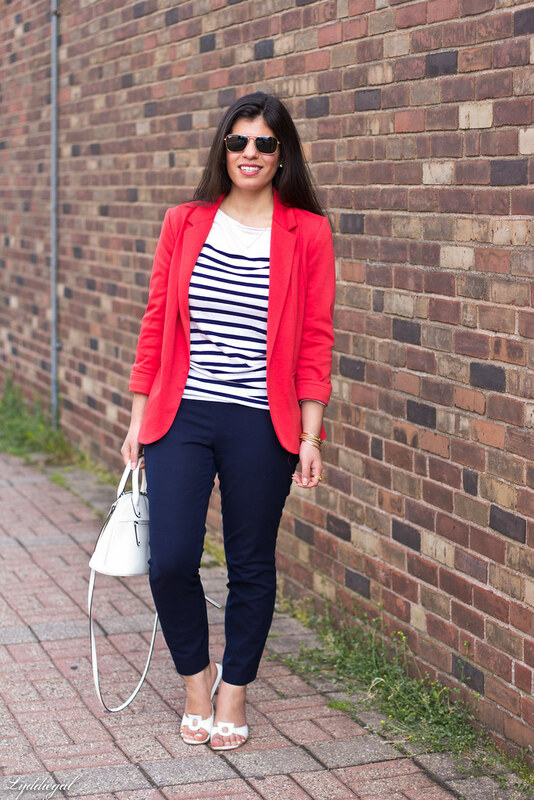 On an outfit related note, this look is pretty much perfect as far as I'm concerned - it incorporates pretty much everything I love, from white accessories to dark skinny jeans to a breton stripe top and a pop of red. 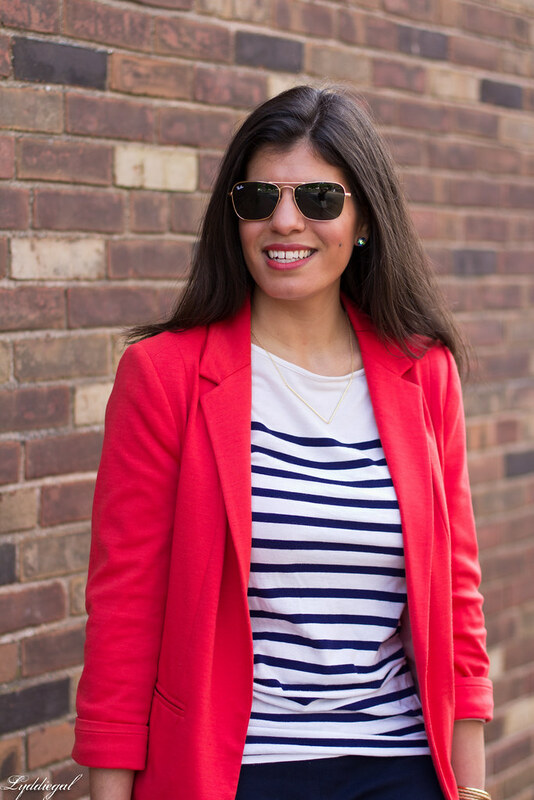 Granted I'd be more inclined to add red with lipstick, but the blazer is a much braver choice and it looks just gorgeous on you. 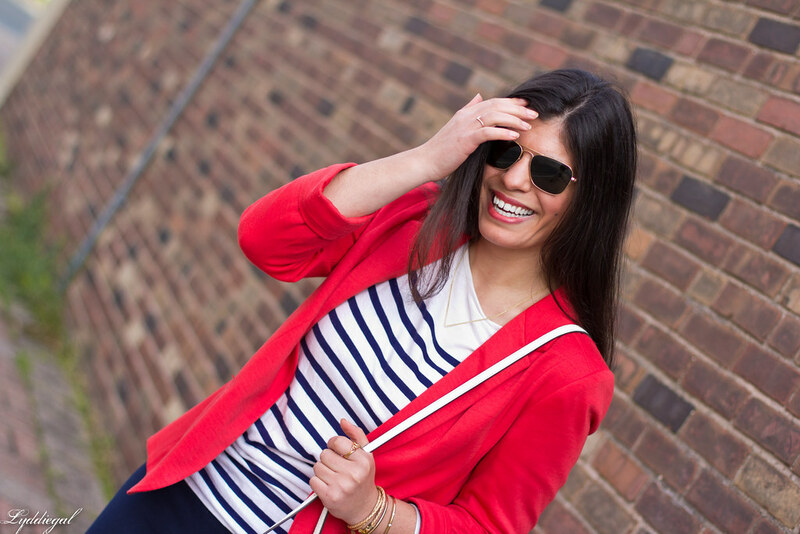 Blogging is absolutely fun, but that doesn't mean you can't take break from it. It doesn't mean you hate it, you just need a little break. We'll still be here! 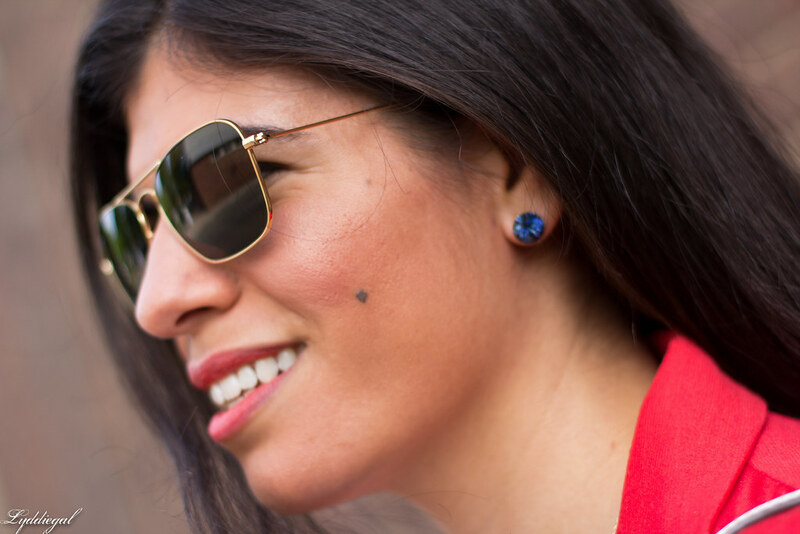 Love your classic color combo, perfect for this time of year! I want to give you a standing ovation right now. I whole-heartedly agree with you. It is SO annoying when people tell me that they wish they had the time to clean their house like I do or blog like I do or dress like I do or take pictures like I do. I'm like yes, I have kids. Yes, I have a job. And yes my time is limited but I MAKE time for what I like and for what I think deserves my time. And I feel the exact same way that you do when people say that to me--so infuriating! I am glad that you make time to blog because your blog has been and always will be one of my faves! 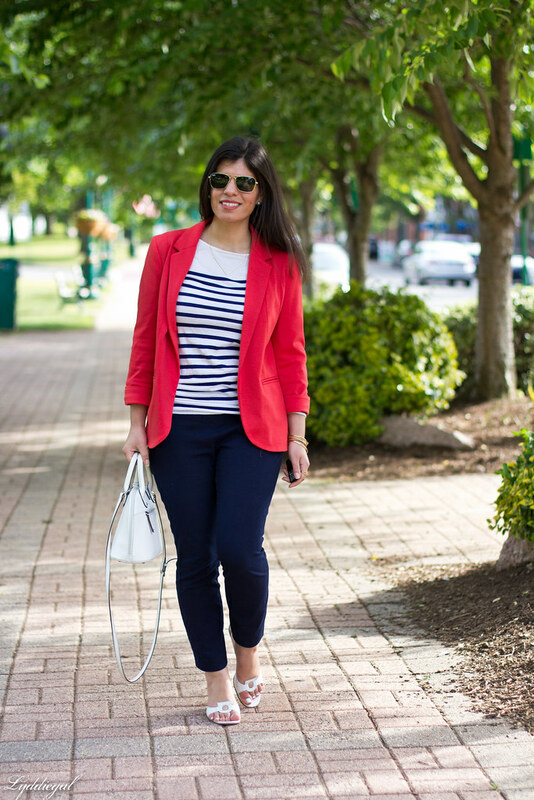 Love navy looks with red pops! Love this classic and chic look! Love this forever classic look on you and I thought it would be sleveless wear in your area this late in June. First of all, I love this cute, classic look. Secondly, you TOTALLY deserve a break! I think it's really hard to fit in blogging, working, family & friends, and everything else that is important. I agree that you make time, but at the end of the day you do have to make sacrifices to do ALL the things you want to do. It's something I still struggle with and I don't think I'll ever have it all figured out. Of course the blazer is Wallis. I've loved everything you've ever worn from that brand. It's very true about the have time vs. make time. Finding a way to make time for everything on the list is the challenge, not "having the time" in general. The way you put it is quite eloquent. There are several things on everyone's plate recently it seems like. Makes it hard to keep up with it all. My boss was out of town for two weeks. How I find myself even more backed up than before is beyond me. You are one of the most consistent bloggers I follow. You are well overdue for a vacation sweetie! I used to be hard on myself about not being able to blog 5 days a week but I know what I have on my plate. I blog on a weekly basis as many days as I can and I'm comfortable with that. 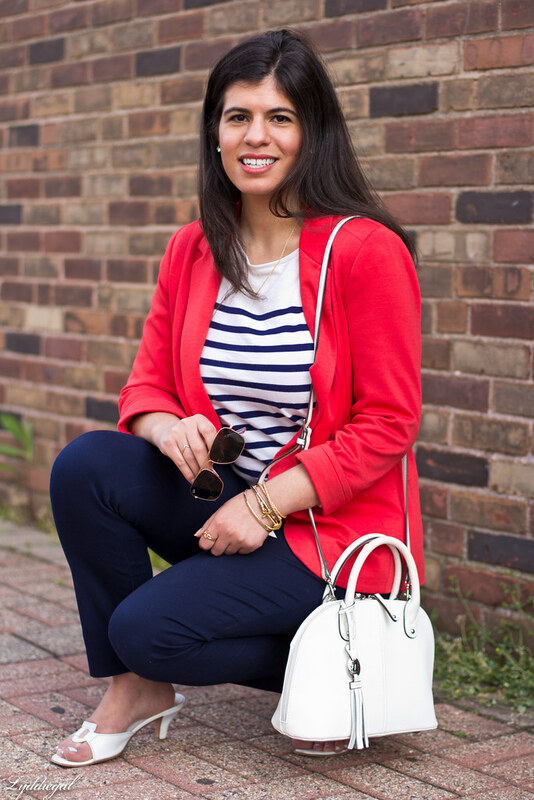 Love your nautical look. I can truly understand your pain. I admire that you do five a day blogposts, thats amazing. I try my best two, but sometimes just life just happens. I believe there isn't right or wrong way how to do things it's all about - do we enjoy it. You have absolutely any rights on your vacation or what ever you want to do. It's your blog, it's your life. To all those people who say something like that, oh, well. They just can wish. This is such a wonderful classic look. 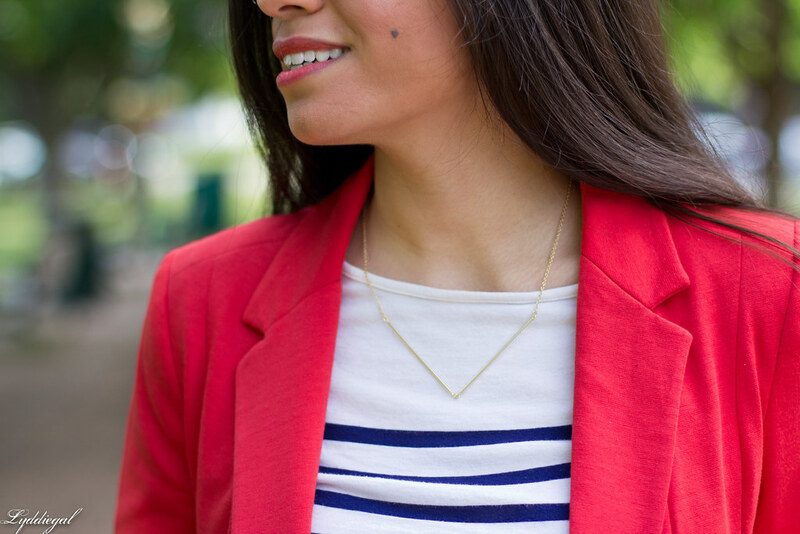 Breton top is one of my favorites to start with any look. 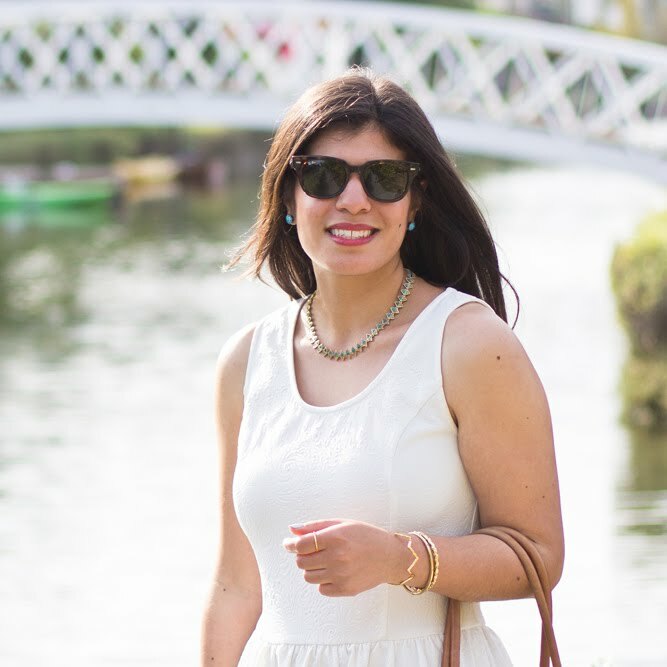 You are so amazing at keeping up on your blog and being so diligent about it! It's been a goal of mine to make more time for mine - and I agree - you have to MAKE time! But you're doing fabulous. Ughhh I totally know how you feel. I have had so much going on that my posting and commenting has taken a bit of a backseat. But I am refusing to let myself feel bad about it, and you shouldn't either! We can't do everything! You are awesome. Just do what you need to do. I love your attitude about time - so true that you make time for what you want to do. My friends always wonder how I work full time, work out 5-6 days a weeks, have a family, blog, read and take care of the house. I just make time.. Some days, I am really tired but I make it all work somehow. You totally deserve a break! I decided a while back to blog only 3x a week but it does not seem to have lessen my time blogging. I'm a bit of a grump when it comes to time. Especially when people say that they had so much going on, so they're late showing up to meet me. Because my time is less important? Please. Totally agree! It is all about how you structure your time, you make time for what is important to you. I get so annoyed when people make comments about how I spend my time lol. You look adorable, so perfect for the 4th! Lady friend, a blog break is totally fine! I rarely post when I'm on vacation. It's too stressful to worry about that and worry that I'm not forgetting to pack underwear! Haha. I can't stand when people always say how busy they are. It's a new way to brag and it's strange. What's wrong with leisure time? What's wrong with doing absolutely nothing because it's nice? 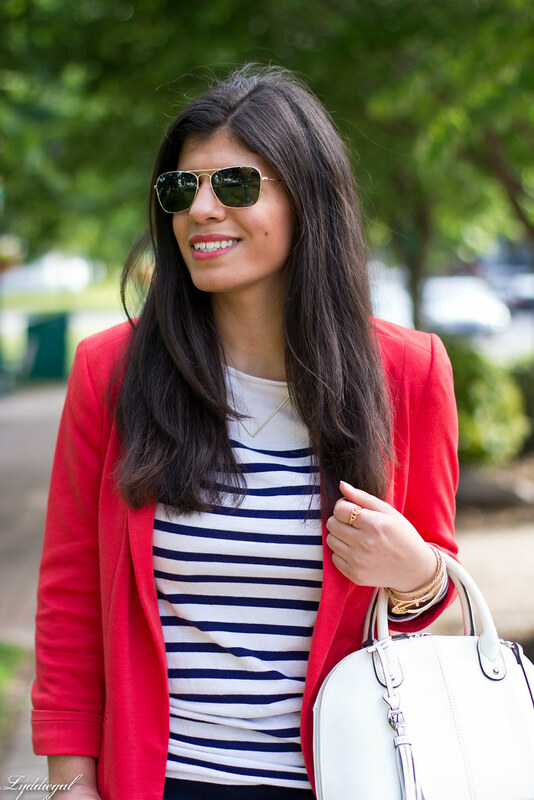 I love that red blazer! I don't know how you've managed to post 5 days a week! I think you definitely deserve to take a break (although not too long because I would miss your posts!). I am very impressed you have never taken a break! That is amazing! 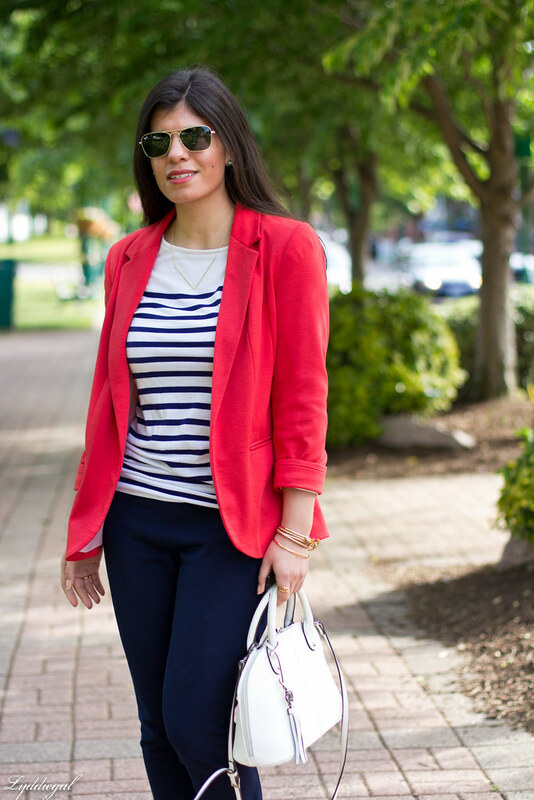 Love that gorgeous red blazer on you! Yep, we do make time for the things we really want and need to do! I love that you wrote that. It shows us what we think is most important in our lives and what keeps pushing us forward. I knew when I wasn't blogging, I missed it so much, and I honestly didn't have the hours to keep it going. I mean, I had them, but they were focused on school and art instead. I can't believe you haven't taken a break! You're such a hard worker! But I understand that mentality completely. Does relaxing stress you out, too?